Several years ago, I wrote a blog called, “Climb a Tree.” In it, I described the scene found in Luke 19:1–10. Jesus said to him, “Today salvation has come to this house, because this man, too, is a son of Abraham. For the Son of Man came to seek and to save the lost. That was the question burning on my heart that particular day. However, today as I sat in prayer, the story of Zacchaeus was again pressed upon my heart. 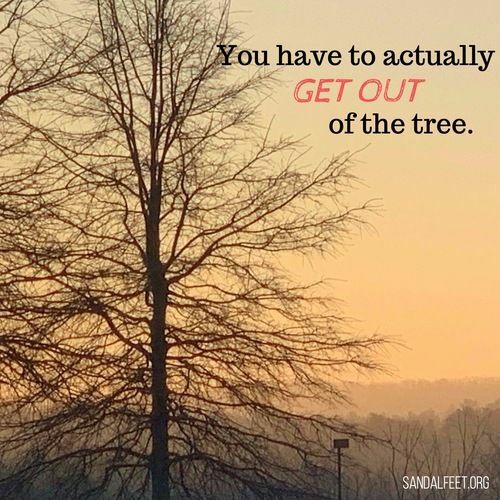 Today, the question wasn’t whether or not people have climbed the tree to see Jesus; the issue was more about whether or not people have gotten out of the tree to live the life Jesus came to give them. I say this as a word of encouragement—some of you have been waiting in the tree for Jesus to do something for you, for your situation or for someone you know. But you know what? You can’t stay in the tree. Over and over again, I hear it loud and clear these days, “Even if I do nothing that you ask of Me, I have done enough.” This is the same answer Jesus gave in verses 9–10. Salvation has come. Jesus saves. It’s enough. It has always been enough. What if Jesus hadn’t called Zacchaeus by name? Would Zacchaeus have come down from the tree with the same enthusiasm and joy? Would he have stayed in the tree? How ridiculous would that have been? First Peter chapter two instructs those who have been born again of Christ about their purpose. If we stay in the tree, we are like those who stumble around in the darkness grasping for anything to help us feel better. Be warned, the crowds will disperse, and you’ll be left sitting in the tree. In the darkness, loneliness, and emptiness when the world is silent and has moved on to fulfill their destiny, you may find yourself face to face with the Enemy who wants you to stay in the tree. He doesn’t want you to climb down and realize that Jesus knows your name. Jesus has called you, and you are His (1 Peter 2:9). Only after we get out of the tree, are we positioned to “show others the goodness of God” (1 Peter 2:9). It wasn’t until after Zacchaeus climbed down from the tree that he made a difference and revealed the light that overcame the darkness within him. Zacchaeus, before his encounter with Jesus, was a liar and a thief. But because Zacchaeus got out of the tree, he recognized his sin, and even more than that, he accepted his Savior. Goodness overflowed from him after that encounter. He reconciled relationships and made good on the things he had done that had caused harm. Many of us will climb a tree to get a look at something. We are curious creatures. However, some might not ever get down from the tree because the coming down part is the part which reflects our humility and our need for Jesus. Jesus calls you by name whether you realize it or not. The irony in Zacchaeus’ name is that his name means, “pure.” By earthly standards, Zacchaeus was anything but pure. But God doesn’t see darkness or light when He looks at you or I. “Darkness and light are the same to you” (Psalm 139:12). How can God see both darkness and light as the same? Because He loves us with an everlasting love. When Jesus was on the cross, He said, “Forgive them, Father, for they know not what they do,” (Luke 23:34). You are one of “them.” Humble yourself and believe in Him. Trust that no matter what, it’s going to work out according to His purpose (which may not look anything like you might think or want it to) (Romans 8:28). Get out of the tree. Live the life God has prepared for you. Be the light. Make a difference. If you haven’t climbed the tree yet, perhaps by reading this blog, this is your moment to climb the tree and get a glimpse of Him. Today’s the day Jesus wants to say to you, “Hey, __________. I want to meet with you. I want to change your life. Salvation has come to you today. You are the reason I came.” Say, “Yes!” and get out of the tree.